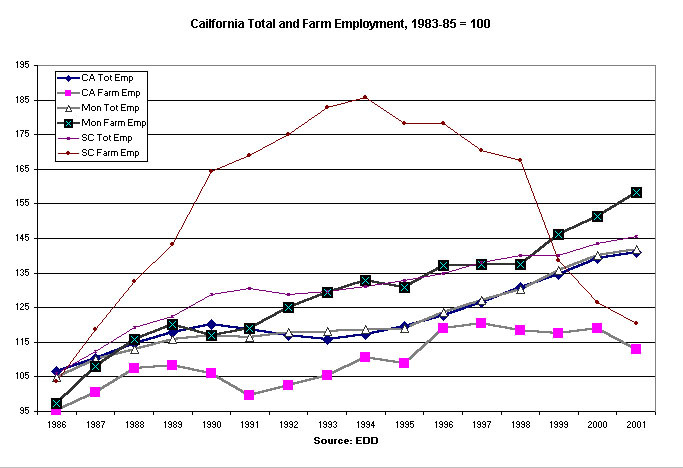 Between 1985 and 2001, average employment in California increased 41 percent, from 10.7 million to 15.1 million, while average farm employment increased 13 percent, from 343,000 to 388,000. These patterns were different in Monterey and Santa Cruz counties, the focus of the 2003 Changing Face seminar. In Monterey county, total employment rose 42 percent, the same as statewide employment, but farm employment rose much faster, 58 percent. In Santa Cruz county, farm employment almost doubled between the mid-1980s and mid-1990s, but fell sharply in the late 1990s.